Kiyomizu-dera is one of the most famous temples in Kyoto, every year more than 5 million people visit and was built at the end of the 8th century. The main hall was constructed in the 17th century. The temple enshrined Kiyomizu-gata-eleven-headed, thousand-armed bodhisattva Kannon, who is only revealed to the public once every 33 years, and is famous for its location overhanging a cliff. The platform of the main hall, which is supported by 139 giant pillars, affords a spectacular view of the town of Kyoto. There are 30 buildings on the temple grounds, which expansive 130,000 sq m. Visitors can see many Important Cultural Properties, the three-storied pagoda, belfries,such as the famed wooden stage “Kiyomizu-no-butai” that juts out from its main hall, It was built upon a crif. It stands about 13 meters, and is supported by an incredible lattice-like assembly of timber joined together without a single nail. The stage affords visitors a nice view of the numerous cherry and maple trees below that erupt in a sea of color in spring and autumn, as well as of the city of Kyoto in the distance. The magnificent main gate is 14m tall and 10m wide, and is known as Akamon(red gate) due to its beautiful color and the beautiful red pagoda is 31m tall.It features richly colored esoteric Buddhist paintings as well as celestial maidens and dragons painted on the ceiling and pillars. This waterfall is fed by a single source that is split into these streams, and visitors use cups attached to long poles to drink from them. Each stream’s water is said to have a different benefit, namely to cause longevity, success at school and a fortunate love life. However, drinking from all three streams is considered greedy. 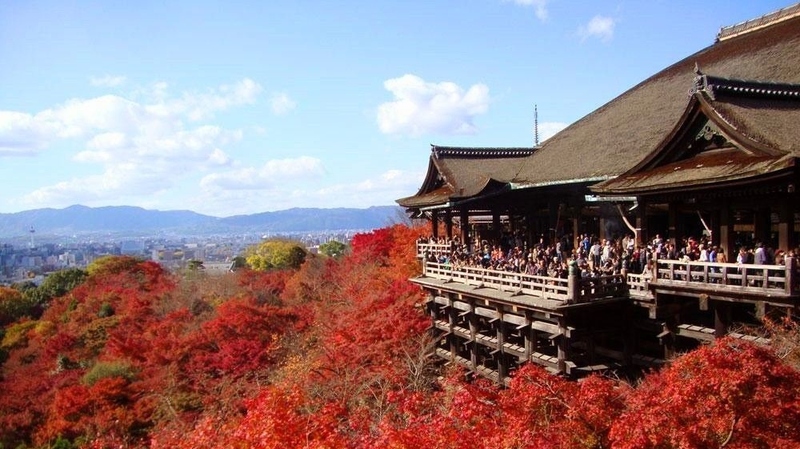 Kiyomizu-dera Temple is filled with a sea of autumnal colors and evening illumination is provided during the season.